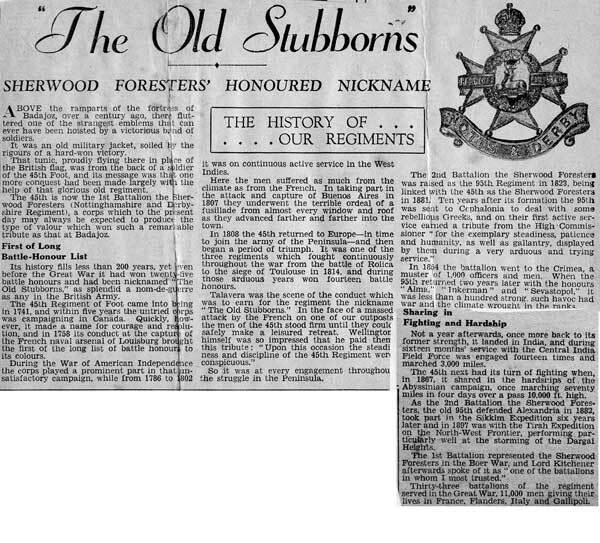 What follows is a transcript of hand-written history of the Sherwood Forester Memorial Tower by Mr Ludlam. It comes courtesy of Malcolm and Brenda Adderson who were wardens at the Tower 1980 – 1992. Col C. B. Fairbanks, Major General C.B., C.B.E. That the numbers at each Battalion casualties might be shown on the memorial. O.C. all Battalions and Service Battalions whenever possible – O.C./Depot – the executive committee of the O.C.A. Col. Stepney, Col. Pearson, Col. Goodman and Mayor Banes with power to add to these numbers. At the 10th annual dinner which followed Lt Gen the Rt. Hon Sir Frederick Shaw K.C.B. (better known as “Buster” Shaw) addressed the company in the absence of the President General Sir Horace Smith-Dorrien, prevented by duty from attending. General Shaw said – – – Prior to the ’14 war the Regiment comprised 1800 in the 2 line Battalion whereas during the war the Sherwood Foresters raised 32 battalions, 150,000 men almost equal to the entire peace time strength of the British Army – – – he was in sympathy with the idea of a memorial and they must do something worthy. He had not crystallised his views on the form the memorial should take. It should be one that could be seen by the public, the bereaved relatives and the young soldiers were coming into the Regiment to uphold its future honour and the honour or the honour of the Country. It is doubtful whether in the whole history of Crich so many people have congregated as on Mon 6th August. The opening of the memorial tower attracted a host of people. It would be difficult to discover a more suitable site – – can be seen for many miles and neither resident nor visitor can look upon it without giving a thought to the tremendous sacrifices it commemorates – – the site was granted to the War Memorial Committee on the most generous terms by Major F.C.A. Hurt of Alderwasley Hall. It was erected at a cost of £4,000 raised by flag days etc. The Bank holiday gave everyone a chance to attend and large numbers did so. Special trains and char-a-bancs were run from all parts and a motor bus service ran between Crich and Ambergate Station. The weather was so good it could not have been improved apart from low visibility which interfered with the extensive view. Mr Barns, chairman of Derbyshire C.C.,the Mayor of Nottingham, the Mayor of Derby, the Mayor of Chesterfield, the Mayor and Vice Chairman of Notts County Council Mansfield, the Sheriff of Nottingham. Mr Barret Kenyon M.P. the Chief Constable of Derby and Derbyshire. There were present the band of the 1st Battalion and 170 regular troops from the Depot and detachment from 5th, 6th, 7th, and 8th Battalion. 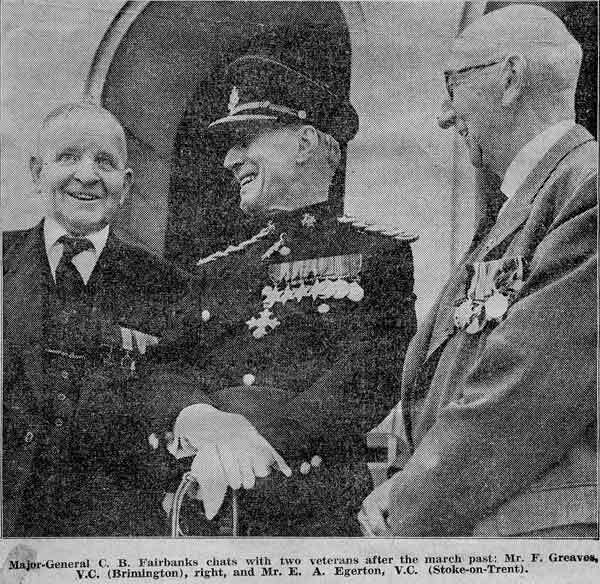 The ceremony of opening the door was performed by Gen Sir Horace Smith-Dorrien GCB, CC, MC, DSO, Colonel of the Regiment. The service commenced at 4 pm with the singing of ‘O Valiant Hearts’. The lesson was read Rev A Stanley Bishop Hon Chaplain to the Foresters. A golden key was then handed to Gen Smith-Dorrien by Capt Brewill who was associated with his late father Col A.W. Brewill in designing the tower. The Rt/ Rev the Lord Bishop of Southwell DD gave the dedication. The last post was sounded by the 1st Batt buglers then the hymn “O God our help” After the blessing the Reveille. The General was received with enthusiastic cheers. He said the memorial was unique and it seemed wonderful that within a month of giving active service he should have the great honour of opening the war memorial of his own beloved regiment. The tower would be a reminder to their children of the 150,000 men who, leaving hearth and home, underwent hardships with marvellous endurance – – –the name of the Sherwood Foresters became synonymous with bravery – – – In conclusion the General appealed to them to see that neither want nor unemployment fell to the lot of these splendid fellows who served the Empire in its hour of need. The Annual Gen Meeting of the O.C.A. at the Mechanics Institute Nottingham 20th October 1923. Gen. Smith-Dorrien in the chair supported by Brig Gen Roy and Lt Col Dunbell and 120 members. Lt Col Dunbell gave particulars relating to the work of the erection of the memorial and a questions was raised drawing attention to the erection of the caretakers cottage and the Government subsidy of £6 a year for 20 years which it was hopeful would be taken advantage of. A caretaker, Mr J. I. Woolley of Crich was appointed on 21st July 1923 at a salary of £1 a week plus 10% of the takings. D.C.M. 1925 An estimate of £849-9-8 was accepted from Mr Payne of Crich to build the caretakers cottage and the work was completed. Mr Woolley moved in. Entrance fees for 1st October 1924 to 30th Sept 1925 amounted to £89-4-0 a total of 7136 persons paying for admission. Death of General Sir Horace Lockwood Smith-Dorrien GCB, GCMG, DSO, died on the 12th August 1930 at age of 72. Most beloved Colonel, Comrade and Friend. Poem on the death of Horace Smith-Dorrien published in Regimental Annals 1930. Till – there was light! “I will” replied “the Bull”. “French falls back on the right. and in the boat read Gray. They could not break our left. Tears in thine eyes! Bays on his brow! With thanks to the Regimental Archivist of the Sherwood Forester Collection for sending a printed copy of the memorial poem to General Sir Horace Smith Dorien so that it could be checked for accuracy against the hand-written copy. 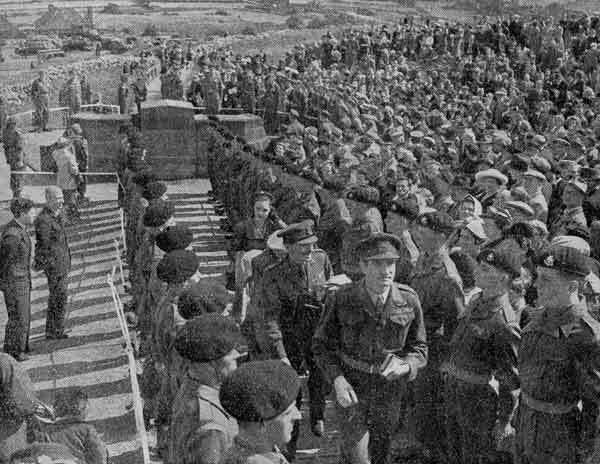 On the 19th July Lieut Gen Sir W.R. Marshall unveiled the memorial to the General. Included in the scheme was the roadway from the main road to the plinth so that vehicular traffic might reach the spot. Previously a pilgrimage meant a tiring climb up narrow boulder strewn footpaths. Hundreds of years ago a wooden signalling platform stood on the summit, rebuilt in 1788 by a cone shaped stone tower with a platform on top. This in turn was replaced on the edge of the escarpment by a circular stand, using the same stones, in 1851. With a spiral staircase to the top. This escaped the great landslip of 1882 bur was later damaged and was closed to the public, being demolished in 1922 and much of the material was used in the construction of the memorial carried out by Mr Joseph Payne of Crich. 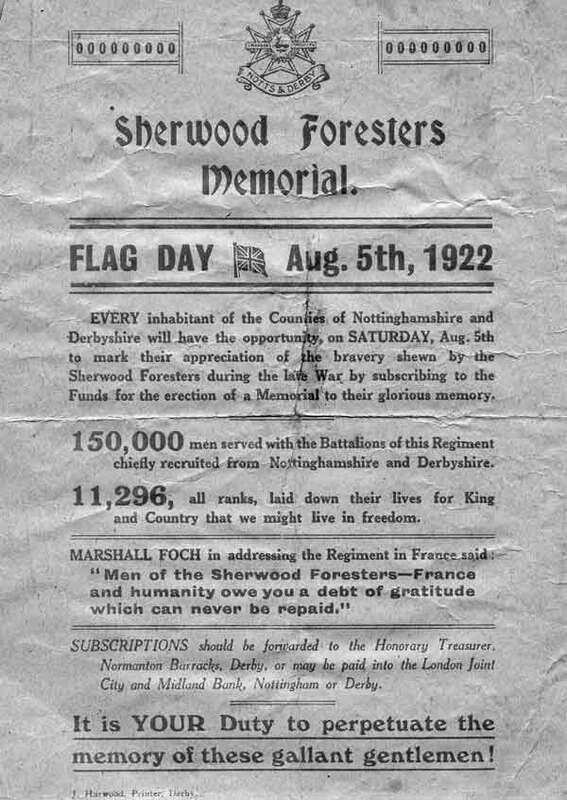 The land for the memorial was leased in perpetuity to the Sherwood Foresters by the owner, Major T. Hurt. 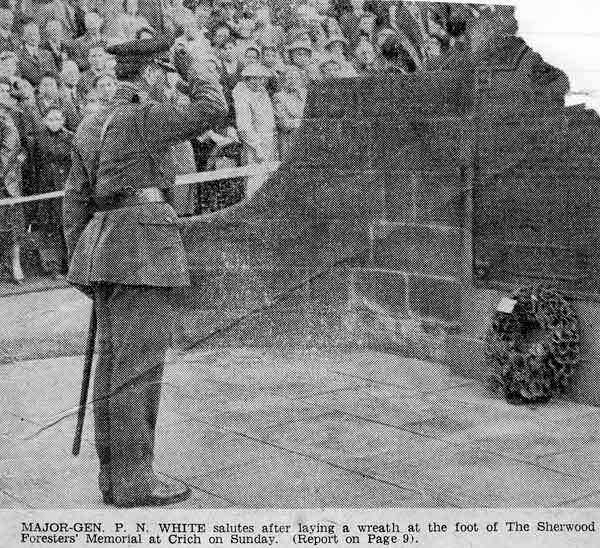 The stones of the old tower were given by Brigadier Jackson of the Clay Cross Co. who also gave £200 as they did not then have to re-erect the tower themselves. The new revolving light was lit on 12 Aug 1934 on the anniversary of General Smith Dorrien’s death. That year it was reported as seen from Burrouch Hill in Leicestershire 38½ miles away. The two tablets in honour of men of the World War Two were dedicated in 1952 by Major General P.N. White CB CBE Hon Colonel in Chief of the Foresters. 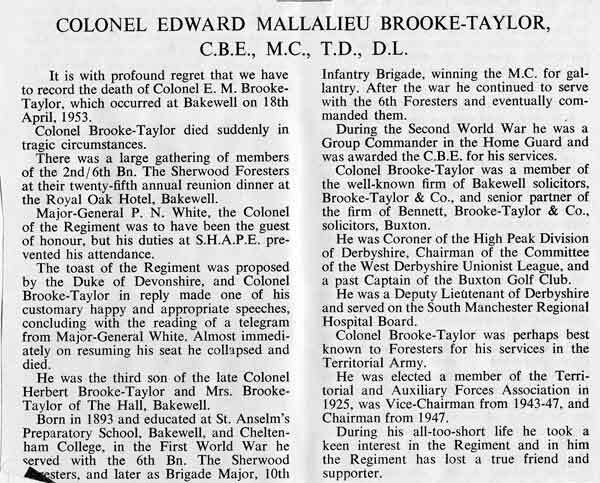 The heavy oak seat is a memorial to Colonel Edward Brooke-Taylor MC TD and was given by the Buxton branch whose president he was at at whose annual dinner he unfortunately passed away. It was constructed by Mr F. Ludlam and his son to the request of the then secretary of the Old Comrades Association. Lt. Col A.A. Deane on behalf of the Buxton branch. It was constructed in Oct 1953 at the works at Spondon and transported by a lorry and fatigue party from the regiment. The cost was £12-0-0. It was dedicated at the pilgrimage in 1954. Mr I. Woolley and Mr F. Ludlam. 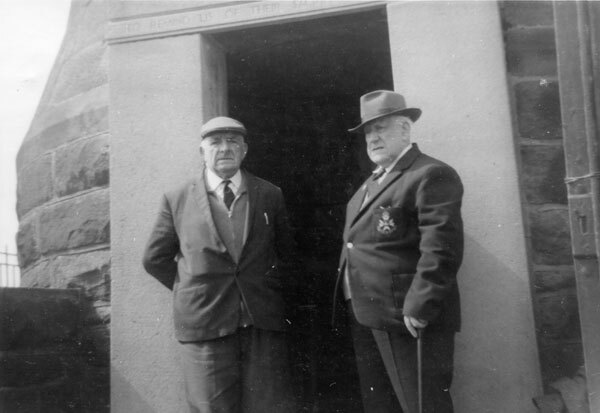 Mr Woolley was Warden of the Tower for 47 years. Pictured above with his life-long friend, Mr Fred Ludlam of the 2nd Battalion 1910-1914 originator of the Annual Pilgrimage. Last week of Mr Woolley’s service. An important man in this history was General Sir Horace Lockwood Smith Dorrien, GCB, GCMG, DSO, ADC (26 May 1858 – 12 August 1930) Colonel of the Regiment, who died of injuries sustained in a car crash. It seems appropriate to add a very brief biography of the man. He joined the army in 1876 and was commissioned second lieutenant in the 95th (Derbyshire) foot. Smith-Dorrien’s first experience of battle came during the Zulu War of 1879 where he was present at the battle of Isandlwana, – one of only five officers to escape from that defeat. In 1882 the 95th saw action in Egypt and the Sudan. At at the battle of Giniss he won the DSO. 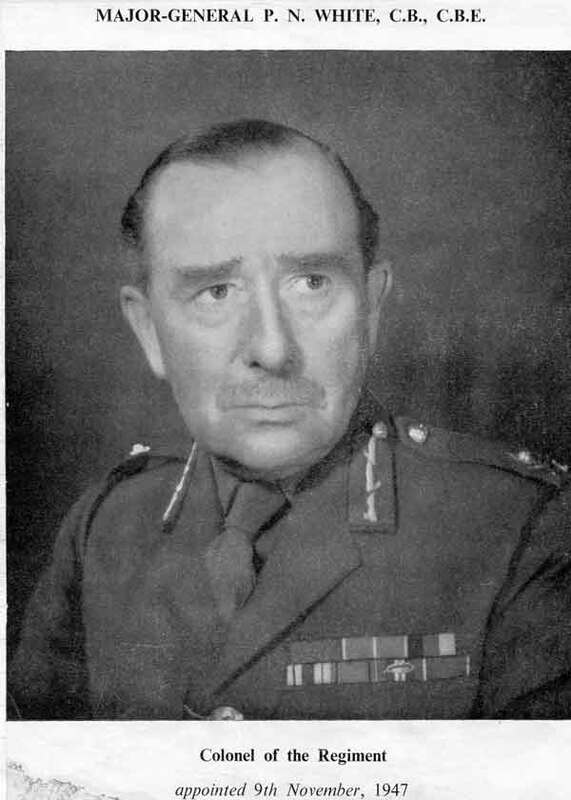 After the Sudan, Smith-Dorrien was promoted to brevet colonel, and given command of the 1st battalion of the Sherwood Foresters. In December 1899 that battalion was part of the army corps sent to South Africa. The war in South Africa would begin a feud between Kitchener and Sir John French. Kitchener was a supporter of Lord Roberts, and served as his chief of staff. Neither Kitchener nor Roberts were impressed with French’s performance. Smith-Dorrien sided with his patron Kitchener, while French had the support of his own chief of staff, Douglas Haig. All four men would hold senior posts in 1914. 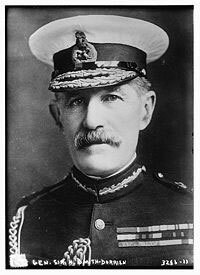 The controversy between French and Smith-Dorrien renewed in 1907 after Smith-Dorrien was promoted to lieutenant-general and appointed to replace French as commander of the Aldershot command. In 1912 Smith-Dorrien was moved to the southern command and promoted to full general. Smith-Dorrien was not initially appointed to a senior command in the BEF in August 1914. II corps was to be commanded by General Sir James Grierson; he died shortly after appointment of a heart attack. 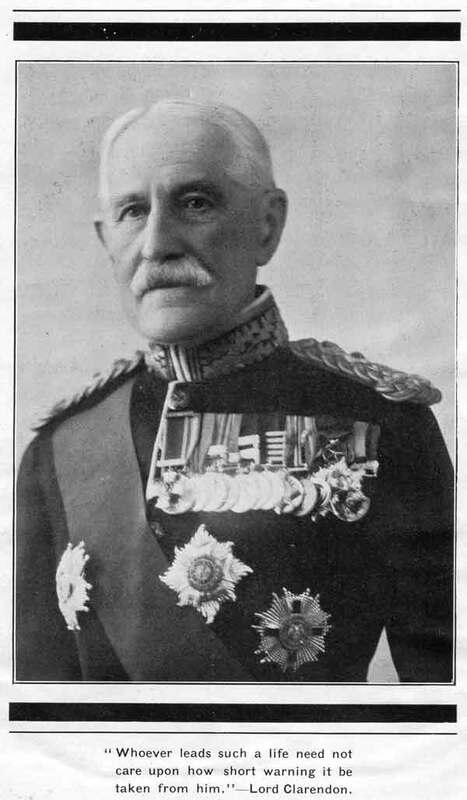 Sir John French was now commander of the BEF and wanted Lieutenant-General Sir Herbert Plumer to take over II corps.Kitchener had just been appointed secretary of state for war and decided to appoint his old protégé Smith-Dorrien to command II corps, creating a potential for disaster in the British high command. The high point of Smith-Dorrien’s career came when he was forced to stand and fight to prevent the Germans from overwhelming his column. His skilful handling of II corps at Le Cateau, holding off a much larger German force, allowing the corps to escape to the south. The feud with French finally cost Smith-Dorrien his command during the second battle of Ypres (22 April – 25 May 1915). After the German gas attacks Smith-Dorrien recommended pulling back closer to Ypres. French felt that Smith-Dorrien was being unduly defeatist and Smith-Dorrien was ordered to pass command of his troops to General Sir Herbert Plumer. Smith-Dorrien requested to be relieved of command, and returned to Britain. Meanwhile, Plumer ordered exactly the same retreat as Smith-Dorrien had planned. In January 1917 he was appointed lieutenant of the Tower of London and between 1917 and 1923 served as governor of Gibraltar. The row between French and Smith-Dorrien erupted again after the war. French’s memoirs, badly misrepresented Le Cateau. Smith-Dorrien, as a serving officer, was refused permission to publish his own account of the battle, but was vindicated by the publication of the official history of the fighting in 1914. This information was garnered from www.historyofwar.org and Wikipedia.